One morning while making simple vanilla cupcakes for my friends' birthdays, I was craving another spoonful of Nutella. And while licking the spoon clean I thought, "if I'm craving Nutella so much, then my friends must be craving it too." (Obviously. Because that is how everything in life works.) 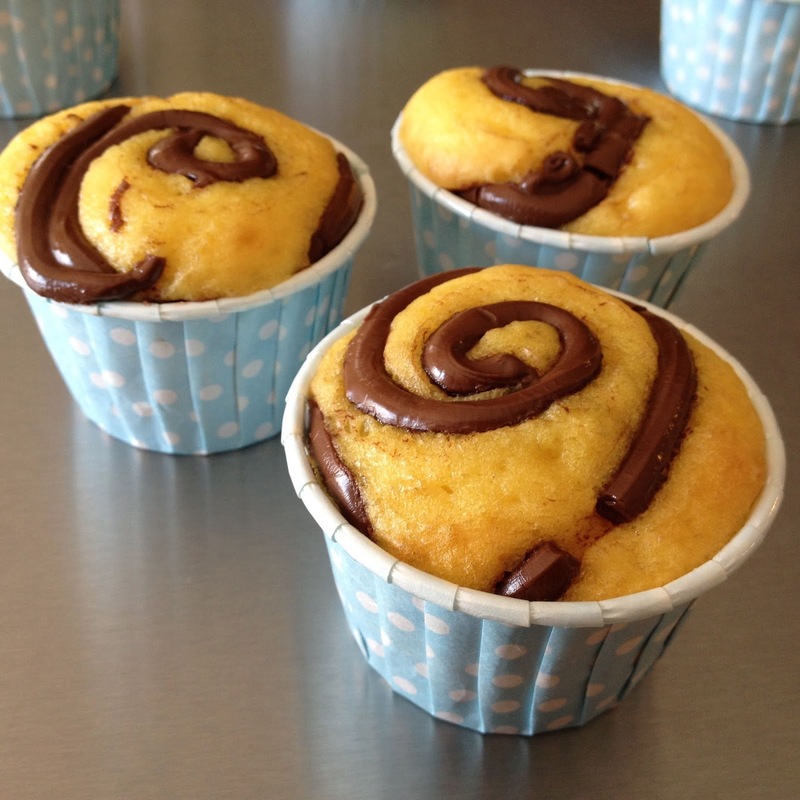 So I thought I'd dress up the plain cupcakes with Nutella and these came to life. Honestly, I thought these turned out looking ugly since I haphazardly piped the Nutella on top in a rush. But I guess someone's ugly is someone else's beautiful since my sister saw them and wouldn't let me frost them. I'm glad she said so since now I can see the beauty in their imperfection. Preheat oven to 350 F. Line regular cupcake pan with liners or grease cupcake pan. In a large mixing bowl, combine sugar and eggs together with electric mixer (or if you are too lazy to clean a mixer, like me, use a fork to mix). Add the flour, vanilla pudding, milk, oil, baking powder and vanilla and mix until all ingredients are well incorporated. Fill cupcake liners or pan until two-thirds full. Microwave Nutella in Ziploc/pastry bag for 10 seconds, cut off a small corner/tip with scissors. Pipe swirls or any design on top of each cupcake. 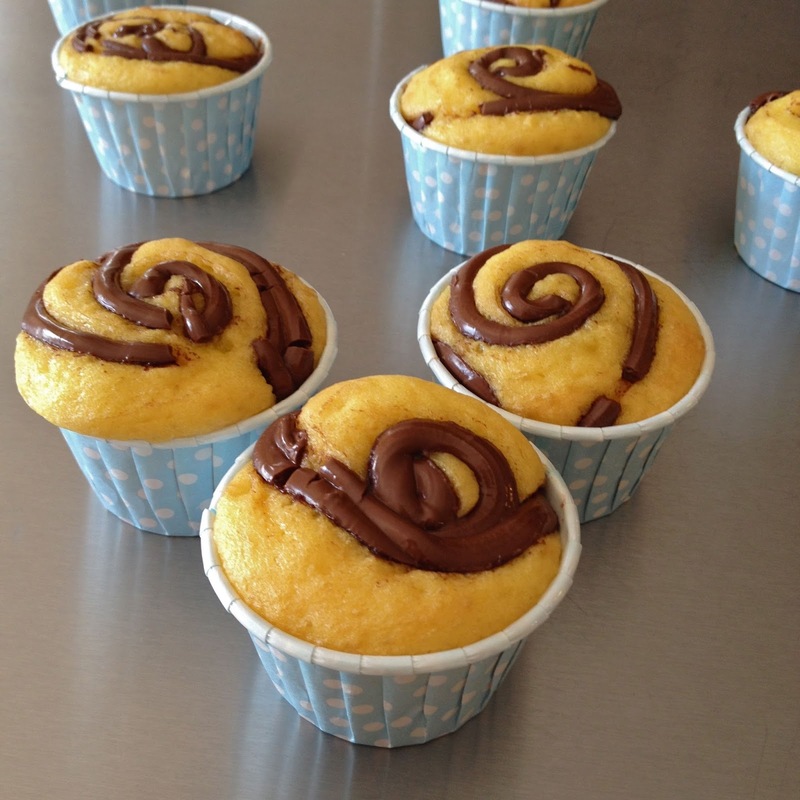 Carefully tap cupcake pans against the countertop a few times to let the Nutella settle slightly in the batter. Bake for 18 minutes or until tops are a light golden brown and bounce back to touch. Buon appetito my fellow Nutella lovers! Hope you enjoy this recipe & leave comments if you have any questions. These look divine! I love Nutella too, have you tried the Trader Joes cookie butter? It has hazelnut chocolate spread swirled in... yum! These look delicious. We like Nutella so these will be perfect for an after dinner treat. I like this simple yet elegant looking idea.